I do not like to get drunk on beer. I drink it because I like the taste. But when I am drunk, I am not a picture to either amuse or disgust. I inherited the ability to handle my liquor, at least something like a gentleman. I am neither maudlin or quarrelsome, nor supersensitive. I do not cause any disturbance nor tell my troubles to strangers. Nor do I weave and stagger. When I cannot walk a straight line, I cannot walk at all. At my best I am a jovial companion, neither smart nor witty, but friendly at least; at my worst I am merely moody and taciturn, desiring only solitude in which to brood over the melancholy images which haunt a gloomy mind. For those who enjoyed my thoughts on Robert Jordan’s death last week, an expanded edition of same is now the featured article at Black Gate magazine. I added some commentary about the Jordan/Gemmell deaths and their legacies, as well as more specifics on the crash-and-burn of Stephen King’s Dark Tower series. Robert E. Howard aficionado John J. Miller, the National Political Reporter for National Review, has conducted an interview with Rusty Burke at National Review Online, focusing on the release of the two Best of REH volumes debuting this summer and fall. Lots of good red meat to savor here. And for those who missed it, check out John’s article on Howard in The Wall Street Journal from late last year. 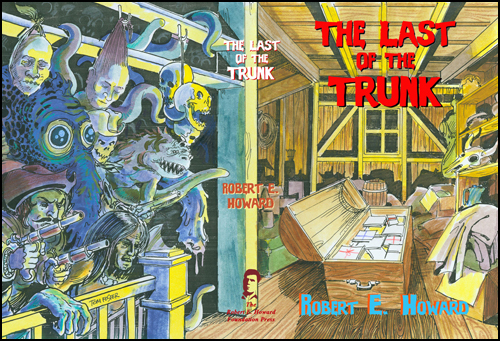 Paul Herman at The Robert E. Howard Foundation recently sent me the following information concerning the much anticipated Foundation release The Last of the Trunk, which collects most of the remaining unpublished detritus of Howard’s career. PAUL: The Last of the Trunk is now available for pre-order. Well, as soon as the website is updated, that is, today or tomorrow. Book should ship in November. Robert E. Howard generated an enormous volume of written works, around 3.5 million words. In his tiny room in his house in Cross Plains, REH kept a trunk to hold all his output that was still awaiting a sale, as well as works that were rejected, unfinished, something he especially wanted to save, or simply copies of early drafts that he would reuse the back of in typing up another story. At the time of his death, that trunk held literally tens of thousands of pages of material, all hand-typed by REH. In the early 1960s, Glenn Lord obtained the contents of REH’s trunk. He had the duty, pleasure, and challenge of sorting it all out, and to begin sheparding those works into print. Hundreds of stories and poems poured forth, to see print in assorted books, magazines, and fan publications. Finally, in this volume, The Last of the Trunk is being revealed. Virtually all the remaining unpublished prose will be included. While this certainly is not his most memorable or impressive work (those works are already in print), it does fill in lots of blank spaces for the scholars and collectors, and perhaps yield a little more understanding of one of the greatest pulp writers. This will be the largest REHF publication to date, at 672 pages. Hardback with dust jacket by Tom Foster. Edited and with an introduction by Patrice Louinet. Design by Dennis McHaney. Many of the works are incomplete or unfinished. Many of the complete stories are either boxing or high school papers. The price will be $53 for REHF members, $59 for non-members. Shipping costs will be posted at the website. The Riders gazed up at Théoden like men startled out of a dream. Harsh as an old raven’s their master’s voice sounded in their ears after the music of Saruman. But Saruman for a while was beside himself with wrath. He leaned over the rail as if he would smite the King with his staff. To some suddenly it seemed that they saw a snake coiling itself to strike. Memorable invective is a joy forever, whether it be that exchange or Moira’s scornful rejection of Thorfel’s offer to make her his lawfully wedded wife in “The Dark Man.” Churls will complain, as they always do, that words like “elsewhither,” “dotard,” or even “gibbet” itself discriminate against the 21st century reader, render Tolkien’s meaning inaccessible to the great unwashed or the borderline unlettered. Too bad. Howard and Tolkien were master dramatists when they wanted to be (which is why any REH adaptation that doesn’t revel in his dialogue is foredoomed, which is why no Germanic bodybuilder will ever pass muster as Conan), and their kings and malign beings regularly scale rhetorical Himalayas. Like [redacted], I’ve devoured J. K. Rowling’s Harry Potter novels, but one place where she falls down hard without any cushioning is Voldemort’s dialogue. His each and every utterance is from a broken-spined, jaundiced-with-yellow-highlightings copy of The Supervillain’s Phrasebook. In a steelcage deathmatch or Thunderdome showdown to determine Most Hackneyed, I might bet on Voldmember even against the de Camp/Carter Thoth-Amon, who couldn’t verbally intimidate Scooby-Doo. When the worst of the worst achieve true immortality despite being killed deader-than-dead, (not just Dark Lords, a “human” character like Quilp in The Old Curiosity Shop works as an example) it’s often because a language-kindled nimbus of hellfire blackens the edges of every page on which they appear. 1.	a gallows with a projecting arm at the top, from which the bodies of criminals were formerly hung in chains and left suspended after execution. 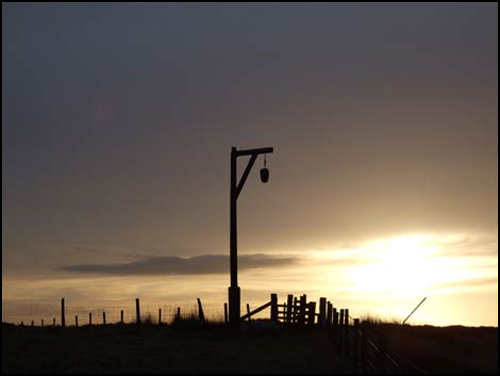 2.	to hang on a gibbet. 3.	to put to death by hanging on a gibbet. 4.	to hold up to public scorn. Having enjoyed [redacted]’s recent “Thoth-Amon, Lord Voldemort. Voldemort, Thoth-Amon” post, I’d like to follow up on Mark’s references to ophidians as “an eternal symbol of menace, ” and “a symbol of ultimate evil.” They aren’t invariably the ultimate evil in Howard’s work, and therein lies a tale, or two tales, “The Scarlet Citadel” and “The Valley of the Worm.” The former story debuted in the January 1933 Weird Tales, the latter in the February 1934 issue; did readers who were paying close attention wonder about a connection between the Satha of “Citadel” and that of “Valley”? 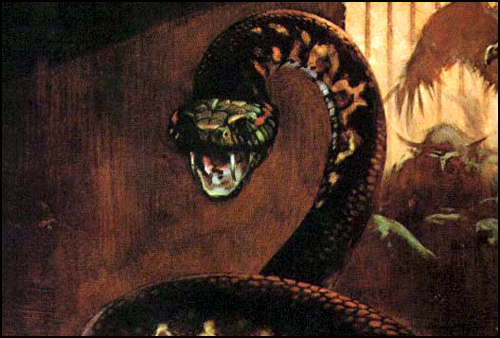 In the Conan story, once the king of Aquilonia is shackled in Tsotha-lanti’s “very Halls of Horror named in shuddersome legendry,” the next order of business is to introduce Satha, which Howard does by way of “a soft rustling sound, blood-freezing in its implications.” Conan, by this point in his life a formidably experienced practical herpetologist, recognizes “the unmistakable sound of pliant scales slithering softly over stone.” What torchlight is available reveals the owner of those scales to be “the ultimate horror of reptilian development,” an eighty-footer the “titan coils” and footlong, scimitar-like fangs of which beggar “all Conan’s previous ideas of snakes.” Satha’s hide “white as hoar-frost” (Frazetta was unfaithful to the text of “Citadel” in his cover painting for Conan the Usurper) leads the Cimmerian to conclude “Surely this reptile was one born and grown in darkness,” but that doesn’t keep its eyes from being “full of evil and sure sight.” Just how sure, we learn as the story progresses.